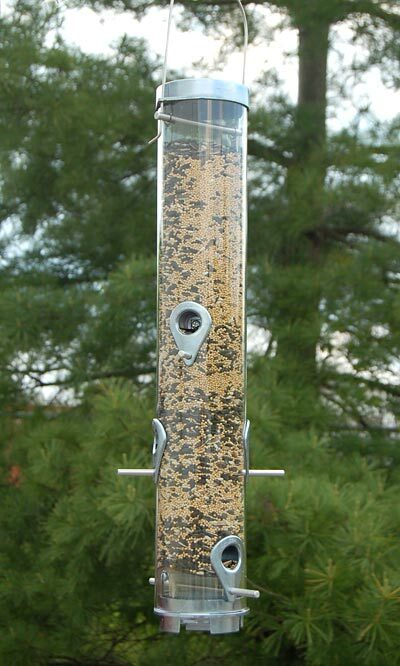 The Droll Yankees B-7 Bird Feeder features an exciting, versatile design that combines the classic tube feeder style with a high quality construction. Bring a little nature into your outdoor environment with this extra large bird feeder. Invite the birds in your habitat to feed comfortably from any of the six individual perches at the reinforced seed ports. The clear polycarbonate feeder tube keeps the seed level visible at all times and is perfect for holding 2.5 quarts of seed. An internal seed baffle design directs seed to the ports so that the feeder empties completely without leaving a dirty residue. Simply slide the die-cast metal cap up the hanger for quick, convenient cleaning and filling. The silver metal feeder base is equipped with drainage slots to keep seed dry and fresh. With its durable construction, the Droll Yankees B-7 Bird Feeder will faithfully serve the birds in your wildlife habitat, season after season. This feeder may be hung on the included metal loop hanger or pole mounted using any pole with a 3/4" threaded adapter (not included). Some assembly required. Made in the USA. Lifetime Guarantee. Note: Attach a Droll Yankees Omni Seed Tray to the feeder base to attract an even wider variety of birds. Droll Yankees Omni Seed Tray, 10.5" dia. Wild Bird Seed Mix, Divine Blend, 5 lbs. Droll Yankees Onyx Seed Feeder, 24"